The kind of bread you eat can have a huge effect on your risk for developing age-related macular degeneration (AMD). That's according to a brand new study looking into the effects of high and low-glycemic diets on mice. This study was conducted at the prestigious Jean Mayer USDA Human Nutrition Research Center on Ageing, which is a part of Tufts University. In addition to studying the effects of these two diets on eye health, researchers believe they've discovered crucial biomarkers for AMD. 59 aged mice were used in this study. 19 of these mice were fed a low-glycemic diet while the other 40 were fed a high-glycemic diet. 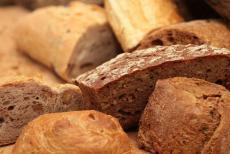 Carbohydrates made up 45 percent of both groups' overall diet. The starch was 100 percent amylopectin for the mice eating a high-glycemic diet, whereas the low-glycemic group had amylopectin starch at 30 percent with amylose making up the other 70 percent. This first phase of the test went on for six months. At this point, researchers started giving half of the high-glycemic mice a low-glycemic diet. The results from their study were quite clear: the high-glycemic mice had a much higher risk of developing AMD than the mice on low-glycemic diets. Perhaps the most important finding from this study came from the mice that switched from a high to a low-glycemic diet. Researchers found that these mice were able to halt the deterioration of their retinae significantly just by switching to whole grain bread. Indeed, the scientists said they couldn't tell the difference between the eyes of mice that were fed low-glycemic diets the whole time and those that switched halfway through the study. Researchers were also able to detect biomarkers related to AMD in this test. All advanced glycation end products (AGEs) were directly related to an increased likelihood of getting AMD. C3-carnitine and serotonin, however, were directly linked to lower risks of developing AMD. As of today, there are numerous methods doctors can use to test infants for C3-carninite and serotonin levels. The doctors on this study believe testing these two biomarkers can help predict a person's susceptibility to AMD in the future. Research into AGEs is relatively new and will require more clinical trials. Tufts University professors hope their data will encourage more people to look into AGEs and their relation to AMD. Anyone can read the full report of this study online in the Proceedings of the National Academy of Sciences of the United States of America. The study was titled "Involvement of a gut–retina axis in protection against dietary glycemia-induced age-related macular degeneration."